1974 The 1974 Mustang Ghia was a special sport luxury package for the 2-door coupe body style. The Ghia options package included spoke-style wheel covers, a vinyl roof, deluxe color-keyed seat belts, remote-controlled door mirrors, a Super Sound package, shag carpeting, wood-tone door panel accents, a digital clock, and a super-soft vinyl or Westminster cloth seats. Ford used the 1970 acquired Ghia Italian design firm for these design choices. 1975 The 1975 Mustang Ghia is a special sport luxury package only for the 2-door coupe body style and includes a half vinyl roof, fog lamps, color keyed body side molding, and luxury interior. 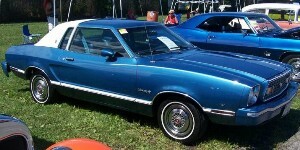 1976 The 1976 Mustang Ghia optioned coupe included a half vinyl roof, hood striping, bodyside moldings, velour cloth interior color-keyed sun visors and headliner, and center console. The Ghia Luxury Group was offered between 1974 to 1981. In 1976 the Ghia package added $334 to the standard notchback coupe (or two-door sedan). Ghia was a group of Italian designers which Ford acquired a controlling interest in 1970. 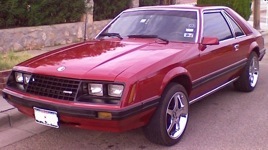 1977 The 1977 Ghia optioned Mustang came with half vinyl roof, pinstripes, unique wheel covers, body side molding, color-keyed interior vinyl inserts and optional Media Velour cloth with large armrests. 1978 The 1978 Ghia luxury group included the half vinyl top, bodyside color keyed body side moldings, bumper guards, wheel covers, and a luxury interior. The 1978 Ghia upgrade did not include one of the more powerful 1978 Mustang engines. The Ghia emblem is just visible behind the rear quarter side window. 1979 The 1979 Ghia luxury group is available for both the 2-door coupe and 3-door hatchback body styles. This luxury package which consisted of several exterior and interior options including: color matched dual remote control mirrors, quarter louvers, and body side molding inserts; and luxury soft interior seats. 1980 The 1980 Ghia luxury group continued to be offered on the coupe and hatchback. The Ghia package included full wrap around black body side molding with argent gray inserts; high back vinyl seats with European styled headrests, turbine wheel covers, and Ghia badges on the decklid. 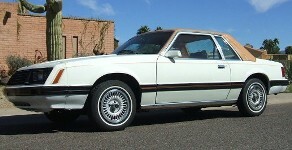 1981 The 1981 Ghia included many luxury items including black remote control side mirrors, body side pin striping, turbine style wheels, low back reclining seats with adjustable head rests and deluxe seat belts with tension eliminators, luxury level cut-pile carpet, and extra convenience lighting (map, dome, glove box, ash tray, engine).